Paullina Simons is the international best-selling author of novels such as Tully, Red Leaves, Eleven Hours, The Bronze Horseman and Tatiana and Alexander. Paullina's novels have won the hearts and minds of readers in countries all over the world. Share book reviews and ratings with Paullina, and even join a book club on Goodreads. 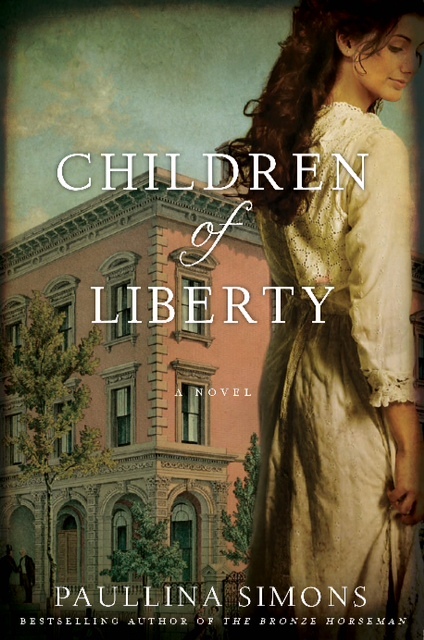 Children of Liberty book giveaway! Just complete the sentence “[Blank] makes me happy” and tell me why. It could be a person, a place, or, for you readers out there, a book! Send your entries to the email address paullinasimonscontest@gmail.com. The contest starts today, and closes next Friday. We will announce the winners picked at random the following Monday, February 25th. And for those of you who don’t end up winning, Children of Liberty goes on-sale in the US on February 26th! Good luck, and as always, thanks for reading. I would love to win this book, im a die hard fan of The Bronze Horseman Trilogy. I’m a SHURA <3 Lover. I cant wait to read this his parents story. TO READ MAKES ME HAPPY!!!! Who I am, and am becoming, makes me happy. I finished my bachelor’s, went to grad school, met the love of my life and decided to leave grad school so we could move to North Carolina. Its been such a whirlwind of emotion and circumstance, adventure and homesickness, love and doubt – but everything we are has led us to people and opportunities and dreams we never knew could exist. Just because we trust who we are, and who we are becoming – not only as individuals, but as lovers. My children make me happy. They are my heart, they are the best part of me. The things I did right in my life. Their smiles, their laughter is the most beautiful thing in the world to me. God blessed me so when He gave them to me. They are my pure happiness. Sitting around the dinner table with my family. Every time I re-read the summer garden I am reminded of my husband. When I read that this is ‘our one life and there is no other choice’ – this gets me every time I read it! What makes me happy is knowing/being reminded of this and making every day count. To love my husband like I did when we first started out together. Happiness is loving my husband to excess, our children and the one life we live together each day. I love your books!! I’ve been reading them since i was 17, I first was introduced to the Bronze Horseman then read Tully and Red Leaves.. I’m alway so moved by your stories. Hope to win can’t wait to read this next adventure! and I have been for 46 years! And thank you, Paullina for writing your wonderful story about Alexander and Tatiana! Life makes me happy, the ups and downs, the highs the lows, the challenges. Always in a state of moving forward and becoming. What makes me happy is watching my baby laghing and washing dishes…..
My daughter makes me happy, because she’s my ray of light! My family makes me deliriously happy, the ups and downs of everyday life carry me through every day with joy in my heart! the sunset in Lake Namtso makes me happy! it reminds me the beauty of serenity and the happy time i spent there with my friends. What makes me happy is having a good coffee with a good book. My five children make me happy. They are my whole world! I was born to be a Mommy and I wouldn’t trade the life I have for anything! Losing myself in a book makes me happy. It’s an amazing feeling to completely escape into another world. Tatiana Metanova makes me happy. I very much love the character of the trilogy ‘The Bronze Horseman’. It changed my life, but especially, Tatia changed everything in me. I reflected a lot about her, she is freckled like me, she has light hair like me. She is as tall as me, and Russian origins, ya, like me! She is a beautiful and courageous woman. When i’m sad or distressed, I think of her and everything magically makes sense. Everything becomes clear, she is my heroine. Tatiana is present in every day of mine, always ready to give me strength, just as she did to her Shura. I am convinced that she really exists, because in my heart she is real. I dream to be her! I try to imitate her, every minute. I try to find her soul and to melt it with mine. This is done through the dress with red roses. I have one identical to her, made by a seamstress. She..Tatiana is joy in living every moment, of sadness and happiness. She is my pure happiness. My 6 children make me happy. Anytime i’m felling down or with no hope, I can always count on one my kids to make me feel better and appreciate life. Listening to my father’s old voice mail messages for me makes me happy. He is no longer here, but hearing his voice fills me with joy. My 6 children make me happy. Anytime I feel down about anything I can always count on one of the to make me feel better.